In 2014, Greenpeace launched an attack on a 50-year brand partnership between Danish toy company LEGO and Royal Dutch Shell, an oil and gas corporation. Through the analysis of Greenpeace's campaign and LEGO's responses over a three-month period, this case study examined how Greenpeace influenced LEGO's communications with its consumers and its subsequent decision to terminate its partnership with Shell. Findings suggest that the popularity of a Greenpeace viral video played a role in LEGO's decision, in addition to accusations questioning LEGO's investment in children's futures. In light of worldwide economic hardship and an increasingly competitive business market, it seems that a family-owned business specializing in the manufacturing of tiny plastic building bricks would be struggling for success. But careful craftsmanship coupled with decades of strategic branding has led the Danish toy company LEGO Group to become one of the most popular toy companies in the world. However, LEGO's 50-year partnership with oil and gas corporation Royal Dutch Shell caught the attention of Greenpeace in July 2014, which launched a campaign attacking the toy company for supporting a corporation threatening the Arctic environment. Greenpeace's attack on the partnership peaked with its release of a YouTube video titled "LEGO: Everything is NOT awesome," a work by BAFTA-winning creative agency Don't Panic. The video depicted an Arctic landscape that was made of LEGO bricks and taken over by Shell oil drillers, showcasing the environment as it is slowly submerged in oil. Greenpeace used a gloomy cover of "Everything is Awesome," the Academy Award-nominated theme song of THE LEGO MOVIE, as background music, and closed the video with a clear call-to-action--viewers have to sign a petition to tell LEGO to end its partnership with Shell. Following multiple other public demonstrations led by Greenpeace and more than 1 million signatures on a petition to end the LEGO-Shell partnership, CEO of the Lego Group Jørgen Vig Knudstrop released a statement on October 18, 2014, that LEGO will honor the co-promotion contract it signed with Shell in 2011 but not renew the contract once it expires. As social concerns become increasingly relevant to global stakeholders, non-governmental organizations (NGOs) wield increasing power over corporate business decision-making. This research examined how LEGO responded to an assault on its partnership with Shell and how Greenpeace's use of viral media to attack LEGO's corporate purpose ultimately drove the toy company to end a successful 50-year brand partnership. To provide theoretical background to interaction between LEGO and Greenpeace, the author did the following literature review focusing on branding partnerships, public relations tactics to promote the activist agendas, stakeholder theory, and situational crisis communication theory. A company's brand, or the unique image or association a consumer may have with a particular product or service, has an important influence over consumer decision-making and should be managed carefully (Keller & Lehmann, 2006). While branding must revolve around creating key associations within the mind of the consumer, companies must also work to differentiate their brands from competitors' in order to establish a strong presence within the consumer market. Occasionally, however, companies may decide to create a brand alliance or co-brand their products (Simonin & Ruth, 1998). These brand partnerships may be formed to combine positive attributes and potentially to conceal or diminish more negative product attributes, though the effectiveness of this method had not been proven through consumer research. These partnerships often occur between lesser-known brands trying to establish a market presence and more well-known brands (Cunha, Forehand, & Angle, 2015). These partnerships usually result in the lesser-known brand gaining more awareness and positive associations, while the well-known brand does not necessarily benefit from the partnerships. Two models based on psychological theory have been used to test the effects of brand associations on consumers and their purchasing decisions: the human associative memory theory (Anderson & Bower, 1973) and adaptive network models (Janiszewski & van Osselaer, 2000). Though these models operate based on different principles, both are founded on the idea that consumers can be influenced by both positive and negative brand associations, and consumers' brand perceptions can influence the reputational and financial well-being of a company or organization. Greenpeace and other NGOs are increasingly utilizing public relations tactics to promote their activist agendas and accomplish organizational goals. Many scholars have examined the roles of public relations practitioners as they manage relationships between organizations and activist groups. Ciszek (2015) argued that activism can actually be viewed as a form of public relations. While classic public relations models may not sufficiently represent how activist organizations employ public relations tactics, Ciszek (2015) proposed that activist efforts be viewed through a cultural-economic lens, which bridges the gap between public relations and activism. To understand how publics may view the communications efforts of activist groups, Jahng, Hong, and Park (2014) examined the effectiveness of moderate versus radical activist group communication strategies. Contrary to their hypothesis that moderate activist groups would gain a more positive perception among publics, they discovered that publics do not tend to perceive a large difference between moderate and radical groups. However, they found that communication strategy itself actually played a larger role in public perception of an activist group. Since public protests were found to be the most preferred communication strategy for both radical and moderate groups, this study suggested that activist groups should focus on selecting appropriate communication strategies, rather than concentrating on promoting their organizations as either moderate or radical. Stakeholders can be defined as "any individuals that can affect or are affected by [an] organization's operations" (Daugherty, 2001, p. 395). Stakeholder theory, first coined by Freeman in 1984, discusses the importance of engaging stakeholders with businesses both in benefitting an organization's mission and reaping positive financial benefits. Since Freeman's first description of stakeholder theory, other scholars have expanded on this theoretical perspective and applied it to numerous areas of marketing, communications, and business. Kaler (2003) explained that, despite its general divergence, advocates of stakeholder theory have agreed that the main purpose of a business is to serve its particular set of stakeholders, and some stakeholders groups may be valued more than others. A main tenet of stakeholder theory also revolves around the idea that organizations may be morally responsible for the well being of certain stakeholder groups (Donaldson & Preston, 1995). In addition, though a company may claim responsibility for certain stakeholder groups, the idea of stakeholder theory also stems from a need for stakeholders to contribute back to an organization's mission or financial well being (Freeman, 1984). Organizations must focus on the perceptions of key stakeholders, as these stakeholders often directly contribute to an organization's financial or reputational goals. Coombs' (2007) situational crisis communication theory (SCCT) suggests that an organization's reputation can be affected by how it responds in a crisis situation, and whether the type of response corresponds with the type of crisis facing the organization. Coombs organized types of crises into three main clusters (victim crises, accident crises, and preventable crises), and proposed recommended responses for each crisis cluster (deny, diminish, and rebuild respectively). Though Greenpeace's attack on LEGO's brand partnership with Royal Dutch Shell may not have been perceived as a communications crisis, the framework of Coombs' situational crisis communication theory can guide the understanding of LEGO's responses to the Save the Arctic campaign, with particular respect to LEGO's focus on the well being of its stakeholders. A key factor of SCCT is based on the idea that stakeholder perceptions of an organization's reputation can be harmed if stakeholders attribute responsibility for a crisis to that organization. Organizations must respond appropriately to crises in order to maintain positive stakeholder perceptions. SCCT has been used to analyze crisis responses for both corporate and nonprofit organizations. Sisco, Collins, and Zoch (2010) examined Red Cross crisis responses over a period of 10 years to assess how often the nonprofit utilized the response strategy according to SCCT. They determined that if the Red Cross had employed the SCCT-recommended strategy more often, the organization could have been able to better repair its reputation during each crisis. Choi (2012) also utilized SCCT to evaluate BP's response to the Gulf oil spill crisis through the analysis of BP press releases. By analyzing the press releases through SCCT frames and examining key terms communicated in the releases, Choi determined that BP was able to effectively handle the oil spill crisis through its communication efforts to improve damage caused by the spill and acceptance of responsibility for the crisis. Qualitative research, specifically the method of case study, was used in this research to better understand how activism targeted at a brand partnership affected crisis communication responses to stakeholders. Specifically, the question guiding this research is how LEGO's communication to its stakeholders evolved in response to Greenpeace's intensifying campaign. According to Yin (2014), case studies use a theoretical framework with the advantage of exploring multiple sources of evidence. The framework of a case study allows in-depth insight, testing of theoretical prepositions, and a look at the phenomenon as a whole, not just at the single elements of crisis communication, stakeholder engagement, or activism. The author examined Greenpeace's activism and LEGO's response by conducting qualitative content analysis of external and internal documents, such as press releases and blog posts, released by both LEGO and Greenpeace during the three-month period when Greenpeace conducted its campaign against LEGO. Multimedia formats, including the two videos released by Greenpeace ("LEGO: Everything is NOT awesome" and "LEGO: Help children save the Arctic"), were also analyzed. Items from Greenpeace and LEGO, including the two videos, were analyzed to observe the evolution of LEGO's responses to key Greenpeace messages as the NGO gradually intensified its strategic attack against the brand partnership. Source documents were reviewed until the data reached a saturation point (Yin, 2014). Through the analysis of these documents, the author created a comprehensive timeline of the crisis, along with a brief overview of LEGO's corporate philosophy and corporate responsibility programs to provide a deeper context for LEGO's corporate background. Documents were analyzed systematically through an open-coding approach for emergent themes (Corbin & Strauss, 2008). This qualitative method allowed for in-depth examination of themes and messages communicated by Greenpeace and LEGO. To enhance validity of findings, the author used a case study approach that triangulated findings from three or more sources (Yin, 2014). The following findings covered analysis of LEGO's philosophy and programs and Greenpeace's campaign against the LEGO/Shell partnership and LEGO's responses. LEGO's core philosophy revolves around its founder Ole Kirk Kristiansen's motto: "Det bedste er ikke for godt," or "Only the best is good enough" (Jobbank DK, 2013, para. 1). The LEGO Group is committed to producing only the highest quality products with the mission to "inspire and develop the leaders of tomorrow" (LEGO Group, 2011, para. 1). LEGO's six values (imagination, creativity, fun, learning, caring, and quality) revolve around its commitment to instilling creativity and imagination in children. Many of LEGO's responsible partnerships incorporate the company's commitment to the lives of children. The LEGO Group funds the LEGO Foundation, an organization that works with schools and families across the world and encourages LEGO's goal of learning through play (LEGO Group, 2013). In addition, the LEGO Group's LEGO Education program focuses specifically on working with educators to provide LEGObased learning resources to schools around the world (LEGO Education, n.d.). The LEGO Group also focuses on environmental concerns with the purpose of making "a positive impact on the world our children will inherit" (LEGO Group, 2014a, para. 1). LEGO's approach includes a commitment to reduce carbon emissions and attempts at using and sourcing manufacturing materials in a more responsible manner. LEGO has set a short-term goal for 2016 of becoming carbon positive, implementing a carbon dioxide reduction program among suppliers, pursuing sustainable raw materials, and having zero waste in production by 2020 (LEGO Group, 2014b). 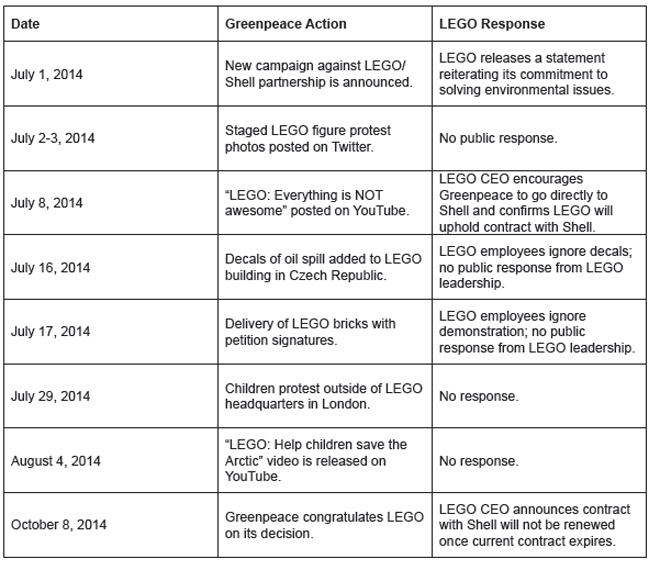 The following highlights how Greenpeace and Lego interacted about the latter's partnership with Shell. The same timeline can be found in a table format in Appendix. June 2012 – Greenpeace launched Save the Arctic campaign at the United Nations Conference on Environment and Development, or Rio Summit (Glaser, 2015). July 1, 2014 – Greenpeace announced new campaign centered on LEGO. Greenpeace accuses LEGO of "putting sales above its commitment to the environment and children's futures" (Greenpeace, 2014a, para. 2). While staging a protest at a LEGOLAND amusement park in Windsor, England, the environmental group encouraged LEGO to "Save the Arctic" and "Block Shell" (Oster, 2014). In response, LEGO posted a statement to its website about continuing "to explore innovative and creative ways to solve the current environmental issues and deliver in compliance with ever-increasing standards," which was later removed. July 2-3, 2014 – Greenpeace tweets staged mini-protest photos, showcasing LEGO figures protesting LEGO's partnership with Shell in front of famous international and national landmarks (Ayech, 2014). The featured landmarks are located in the United States, France, Chile, Colombia, Brazil, New Zealand, Australia, Spain, Canada, Czech Republic, and Argentina (Greenpeace, 2014b). We love LEGO. You love LEGO. Everyone loves LEGO. But when LEGO's halo effect is being used to sell propaganda to children, especially by an unethical corporation who are busy destroying the natural world our children will inherit, we have to do something. Children's imaginations are an unspoilt [sic] wilderness. Help us stop Shell polluting them by telling LEGO to stop selling Shell-branded bricks and kits today. Greenpeace is calling on LEGO to end its partnership with Shell to Save the Arctic (Greenpeace, 2014c). Jørgen Vig Knudstorp, CEO of the LEGO Group, responded with an online statement on Greenpeace using the LEGO brand. He stated that LEGO believes that "this matter must be handled between Shell and Greenpeace. We are saddened when the LEGO brand is used as a tool in any dispute between organisations." He also confirmed that LEGO would uphold its 2011 long-term contract with Shell. (LEGO Group, 2014c). Greenpeace responded through a statement written by Save the Arctic campaigner Ian Duff, who pointed out the discrepancies between LEGO's company values and commitment to environmentalism and Shell's plans to drill in the Arctic. Duff stated, "‘Only the best is good enough' says LEGO's Chief Executive Jørgen Vig Knudstorp. We wish that were true. But as long as the company keeps on helping Shell clean up its image, that can never be the case" (Duff, 2014a, para. 15). July 11, 2014 – Warner Brothers Entertainment accused Greenpeace of unfairly using THE LEGO MOVIE's "Everything is Awesome" theme song, in addition to including two of the movie's main characters, in the parody video. The video was removed from YouTube, where it had gained nearly 3 million views (Turner, 2014). After moving the video to rival streaming site Vimeo, Greenpeace tweeted: "Did we offend someone? Banned from YouTube, back up on Vimeo. Watch our LEGO video [link] #BlockShell" (Greenpeace UK, 2014). July 12, 2014 – Within 18 hours, Warner Brothers retracted its complaint, and the video was reposted on YouTube (Zakarin, 2014). July 16, 2014 – Greenpeace added decals of a Shell logo, an oil spill, and unhappy LEGO figures cleaning up the spill to the windows of a main LEGO production center in the Czech Republic (Greenpeace, 2014d). July 17, 2014 – Greenpeace delivered 50 giant LEGO bricks to the LEGO headquarters in Billund, Denmark. Each brick represented 10,000 signatures on a petition asking LEGO to end its partnership with Shell. LEGO employees did not acknowledge the demonstration, and Greenpeace protesters built a blockade of LEGO bricks in front of the headquarter entrance (Greenpeace, 2014d). July 29, 2014 – Fifty children gathered outside the London LEGO headquarters to build Arctic animals out of LEGO bricks (Lynch, 2014). August 4, 2014 – Greenpeace released a second video, titled "LEGO: Help children save the Arctic." The video was narrated by three young girls from around the world to demonstrate that Shell's actions affect children everywhere. The video was significantly less popular than "LEGO: Everything is NOT awesome," but still garnered views after its release (Greenpeace, 2014e). October 8, 2014 – After three months of Greenpeace campaigning, LEGO CEO Jørgen Vig Knudstorp announced that LEGO would honor the contract made with Shell in 2011, but the company would not renew a contract with Shell when the 2011 contract ends. He reiterated that LEGO believed "Greenpeace ought to have a direct conversation with Shell. The LEGO brand, and everyone who enjoys creative play, should never have become part of Greenpeace's dispute with Shell" (LEGO Group, 2014c, para. 4). Greenpeace congratulated LEGO on its decision with a statement on the Greenpeace website: "This is fantastic news for LEGO fans and Arctic defenders everywhere. And it's a huge blow to Shell's strategy of partnering with beloved brands to clean up its dirty image as an Arctic oil driller" (Duff, 2014b, para. 2). 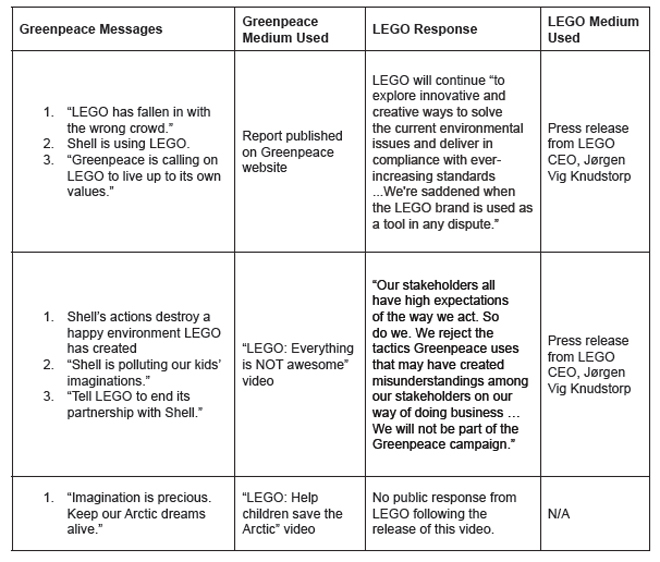 The analysis of LEGO's responses to Greenpeace's campaign shows that, though LEGO did not respond to each step of Greenpeace's campaign, it employed different arguments to deflect Greenpeace's criticism. Its main responses were released in the form of two press releases from CEO Jørgen Vig Knudstorp that were published on the LEGO website. In response to Greenpeace's initial attack on LEGO's partnership with Shell, the toy company reiterated its commitment to finding sustainable solutions to current environmental problems, which was reflected in the information on its corporate responsibility programs provided on the LEGO website. After Greenpeace released its first viral video attacking the LEGO/Shell partnership, LEGO responded by criticizing Greenpeace's tactics. Throughout Greenpeace's campaign, LEGO maintained that Greenpeace should have communicated directly with Shell about the issue and stopped involving LEGO in the dispute. Encouraging a conversation between Greenpeace and Shell and removing itself from the controversy is perhaps the most consistent message LEGO communicated. LEGO was clear in its desire to not be involved in Greenpeace's Save the Arctic campaign in each of its responses, including its final announcement that it would not be renewing a contract with Shell. However, despite its criticism of Greenpeace's tactics and its insistence that it not be involved in the Greenpeace/Shell dispute, LEGO ultimately conceded to Greenpeace's demands. A message communicated in the press release from LEGO after Greenpeace released its first viral video hinted at a main issue that LEGO faced during Greenpeace's campaign. In the release, Knudstorp acknowledged that Greenpeace might have succeeded in creating confusion in the mind of its stakeholders about LEGO. He stated that LEGO "rejects the tactics Greenpeace uses that may have created misunderstandings among our stakeholders." (LEGO Group, 2014c, para. 5). Indeed, Greenpeace consistently pointed out the negative effects of Shell's actions on children's futures and criticized LEGO for going against its own corporate values by supporting Shell. Knudstorp, in turn, perhaps unknowingly acknowledged that Greenpeace succeeded in creating misunderstandings of its stakeholders about LEGO's intentions. Greenpeace arguably created a disconnect in the mind of its stakeholders between LEGO's core values and action by pointing out disparities between LEGO's corporate purpose and its Shell partnership. Freeman (1984) emphasizes the importance of understanding the key perceptions of stakeholders, and LEGO's attempt to repair the disconnect created by Greenpeace's campaign reflects this main tenet of stakeholder theory. In addition, LEGO's response relates to Coombs' situational crisis communication theory (2007), in that the toy company's response highlights its attempt to diminish its responsibility for the crisis in order to maintain positive stakeholder perceptions. In the future, it would be valuable to analyze LEGO's response to Greenpeace's campaign using Coombs' specific categories of crisis and their respective appropriate responses. Additionally, Greenpeace was able to spread this message through the use of a viral video. This combination of the potential of shifting stakeholder perceptions and use of viral media may have been a driving factor in LEGO's ultimate decision to not renew its contract with Shell. Future research could explore this use of viral video as an activist campaign strategy using Jahng, Hong, and Park's (2014) methods of examining moderate and radical activist campaign communication strategies. In an age where consumers value corporate transparency and turn to online media to engage in dialogue about social issues, a viral Internet campaign tying a beloved brand to a pertinent environmental concern could destroy a company's reputation. Greenpeace's calculated campaign strategies, which utilized viral online media and directly attacked LEGO's mission to inspire children worldwide, targeted the very core of the LEGO corporation. Despite LEGO's reputation as a brand that values imaginative play and pursues sustainable solutions, Greenpeace's argument that LEGO's concern with profit outweighed its care for children seriously threatened the perceptions of LEGO among its key stakeholders. As NGOs like Greenpeace continue to execute strategically powerful campaigns to influence corporate decision-making, how should corporations respond? In the case of LEGO, CEO Jorgen Vig Knudstorp criticized Greenpeace's methods of attacking LEGO to get to Shell but ultimately conceded to the NGO's demands. Though LEGO resisted the eventual termination of its contract with Shell for months, its ultimate decision was fundamental in maintaining the positive perception of the LEGO brand among key stakeholders. Because LEGO's entire corporate mission is built on its commitment to children – arguably its most important public stakeholders – and Greenpeace clearly laid out how LEGO's partnership with Shell was indirectly supporting activities detrimental to children's futures, LEGO's eventual decision upholds the values it claims to honor most. LEGO's challenge now lies in its ability to examine how its key stakeholders may perceive future actions and brand partnerships. In order to maintain its reputation, financial success, and standing as a leading global toy company, LEGO must ensure its future business decisions and brand partnerships reflect its corporate values and communicate these connections clearly to its key stakeholders. This author is grateful to Lucinda Austin, assistant professor at Elon University, for her constant guidance and support, without which this article could not have been published. This author is also thankful for Byung Lee, associate professor at Elon University, and the anonymous reviewers for their assistance with the revision of this article. Anderson, J.R., & Bower, G.H. (1973). Human associative memory. Washington, D.C.: Winston & Sons. Choi, J. (2012). A content analysis of BP's press releases dealing with crisis. Public Relations Review, 38, 422-429. Ciszek, E.L. (2015). Bridging the gap: Mapping the relationship between activism and public relations. Public Relations Review, 41, 447-455. Coombs, W.T. (2007). Protecting organization reputations during a crisis: The development and application of situational crisis communication theory. Corporate Reputation Review, 10(3), 163-176. Cunha, M Jr., Forehand, M.R., & Angle, J.W. (2015). Riding coattails: When co-branding helps versus hurts lesser-known brands. Journal of Consumer Research, 41(5), 1284-1300. Daugherty, E.L. (2001). Public relations and social responsibility. In R.L. Heath (Ed. ), Handbook of public relations (pp. 389-401). Thousand Oaks, CA: Sage. Donaldson, T.J., & Preston, L.E. (1994.) The stakeholder theory of the corporation. Academy of Management Review, 20(1), 65-91. Freeman, R. E. (1984). Strategic management. Marshfield, MA: Pitman. Jahng, M.R., Hong, S., & Park, E.H. (2014). How radical is radical? : Understanding the role of activists' communication strategies on the formation of public attitude and evaluation. Public Relations Review, 40, 119-121. Janiszewski, C., & van Osselaer, S.M.J. (2000). A connectionist model of brand-quality associations. Journal of Marketing Research, 37(August), 331–350. Kaler, J. (2003). Differentiating stakeholder theories. Journal of Business Ethics, 46(1), 71-83. Keller, K.L., & Lehmann, D.R. (2006). Brands and branding: Research finding and future priorities. Marketing Science, 25(6), 740-759. Simonin, B.L, & Ruth, J.A. (1998). Is a company known by the company it keeps? Assessing the spillover effects of brand alliances on consumer brand attitudes. Journal of Marketing Research, 35(2), 30-42. Sisco, H.F., Collins, E.L., & Zoch, L.M. (2010). Through the looking glass: A decade of Red Cross crisis response and situational crisis communication theory. Public Relations Review, 36, 21-27. Yin, R.K. (2014). Case study research: Design and methods. Thousand Oaks, CA: Sage.